Maxine Greene, one of the leading educational philosophers of the past fifty years, remains “an idol to thousands of educators,” according to the New York Times. 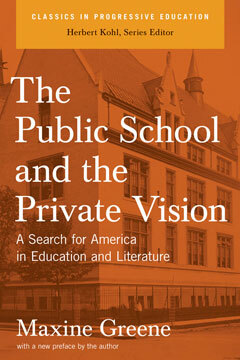 In The Public School and the Private Vision, first published in 1965 but out of print for many years, Greene traces the complex interplay of literature and public education from the 1830s to the 1960s—and now, in a new preface, to the present. With rare eloquence she affirms the values that lie at the root of public education and makes an impassioned call for decency in difficult times, once again a key theme in education circles. A new foreword by Herbert Kohl shows how the work resonates for contemporary teachers, students, and parents. The New Press mourns the loss of Maxine Greene (December 23, 1917-May 29, 2014).